The Roman Villa found at the new site of King's High School. The remains of a previously unknown Roman villa have been discovered during building works in Warwick. 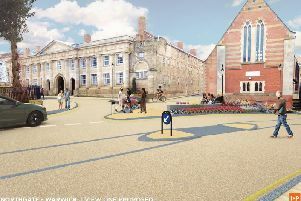 The work on has been undertaken as part of ‘Project One Campus’, which sees King’s High School relocating from the town centre to the main Warwick Independent Schools Foundation site on Banbury Road. Students from King's High School looking at the Roman Villa. Wall foundations for a large aisled structure the size of a medieval church have been uncovered by Warwickshire County Council’s team of archaeologists, who have been on site since October, at the behest of Warwick Independent Schools Foundation. The Roman Villa remains in Warwick. Junior Pupils nvolved in dig. The archaeological work is a requirement of planning permission and in accordance with a Written Scheme of Investigation approved in advance by the planning authority. Warwick Prep Pupils viewing the Roman ruins. Cllr Jeff Clarke, Warwickshire County Council Portfolio Holder for transport and the environment, said: “We are very proud of the work done by the Archaeology Warwickshire team on this excavation in Warwick. “The team are experts in so many aspects of archaeological history and are always willing and able to use that expertise to assist on a wide variety of fascinating projects.